Chicago may be known for its extreme wind gusts (which I may have forgotten about on my latest venture there when I packed only skirts and dresses…), but Cleveland is on the map when it comes to harnessing our natural gusts and gales. Gizmodo* recently published an article featuring our baseball team, the Indians. Not time in the near future will this sports team (or any CLE sports team) be mentioned for its athletic abilities, and no doubt realizing this, the team did the next best thing to push its way into the headlines: they installed a super cool looking turbine. 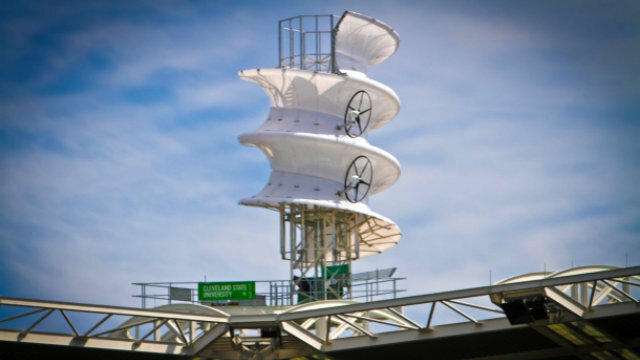 Mounted on a steel base on the ballpark’s southeastern rim, the helical wind turbine is designed to amplify airflow and funnel it into four small turbine fans. The turbine assembly is 40 feet tall, 18 feet wide, and it weighs 3,000 pounds. The helix is constructed from 80 vacuum-formed, hard plastic pieces affixed to an aluminum frame. Four off-the-shelf wind turbines rest within the grooves of the corkscrew. The array will generate an estimated 40,000 kilowatt-hours a year—roughly four US houses-worth—during its year-long test run. If successful, the design could prove useful in urban and confined environments where conventional long-blade turbines simply can’t work.